Former zoo lion, Nelson, and confiscated ‘exotic pet’, Ciam, are today starting new lives in their ancestral home of Africa. Nelson and Ciam travelled from their temporary home in Belgium - via Germany - to Port Elizabeth, in South Africa’s Eastern Cape, where they were this morning introduced into their spacious, safe and enriching accommodation at the award-winning Shamwari Game Reserve. With them every step of the way on their more than 10,000 km journey was Born Free Foundation Co-Founder and actress, Virginia McKenna OBE, who watched with delight as Nelson and Ciam explored their new surroundings. "The lyric goes 'life is worth living when you're born free' but for the two lions, Nelson and Ciam, who were not born free and never lived free, life is now, at last, worth living. Nelson, after 14 years of imprisonment and about two years at the Natuurhulpcentrum rescue centre in Belgium, and Ciam, bought from a terrible circus by someone who kept him illegally in his back yard, will now have a new life at the Born Free sanctuary at Shamwari. Seeing them take their first steps into their huge natural enclosures was utterly joyful. At last they are free to live where lions belong and will be treated with the care and respect they deserve. How lucky I was to be there to share the moment." The two lions started their journey from Natuurhulpcentrum rescue centre, Belgium, on Thursday 4th May. Born Free Celebrity Patrons, comedian Jim Moir (Vic Reeves) and his wife - model and actress Nancy Sorrell - helped carefully prepare Nelson and Ciam for their journey and have been closely following their progress. From Belgium, the lions travelled by road to Frankfurt airport, Germany, for their flight to Johannesburg. From there, they were flown by charter plane to Port Elizabeth, and then travelled by road the short distance to Shamwari Game Reserve. Nelson is now living at Born Free’s Julie Ward Animal Rescue and Education Centre, while Ciam’s new home is at the Jean Byrd Centre. 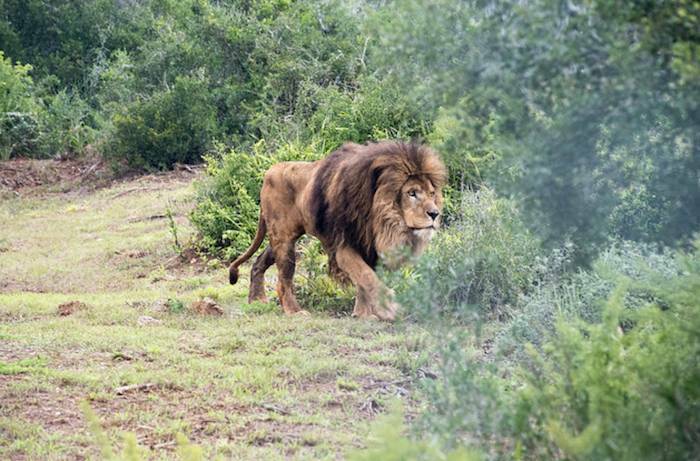 Nelson and Ciam’s new lives at Shamwari Game Reserve will be a world away from their previous circumstances, which highlight the sorry plight of the millions of wild animals worldwide kept for human entertainment – in zoos, circuses or as ‘exotic pets’. Nelson was rescued from a French zoo in April 2015 when it fell into liquidation. Ciam made international headlines in November 2015 when he was confiscated from a cramped cage in a garden in Southern France where his owner was illegally keeping him as an ‘exotic pet’. An increasing number of wild animals are kept as exotic pets, including reptiles, amphibians, mammals, primates and big cats. The demand for these animals fuels both the legal and illegal wildlife trade: some animals may be bred in captivity to supply demand, some may be traded as surplus from zoos and circuses, while others are caught from the wild. Born Free opposes the exploitation of wild animals as pets and campaigns for national and international legislation to reduce and, where possible, end this practice. Campaigning to prevent captive animal suffering and to phase out zoos has been at the heart of Born Free since its formation in 1984. This year, Born Free has gone ‘back to its roots’, with a focus on challenging the exploitation of wild animals in captivity and the multi-billion pound global zoo industry through its Beyond the Bars campaign.